Today's updates include adjustments to Scottish swings based on a new YouGov poll north of the border. 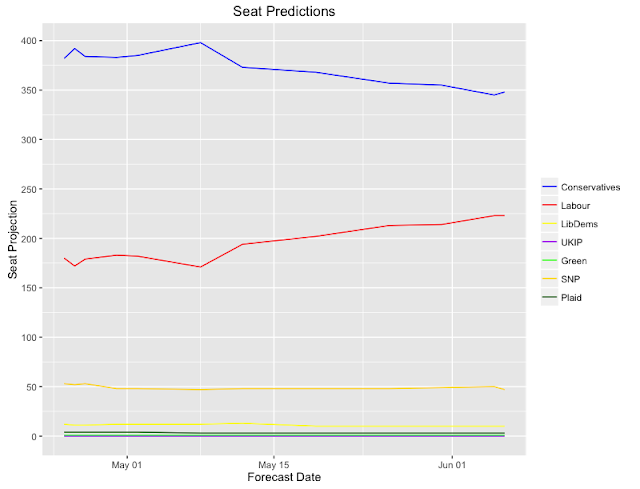 For the penultimate PME Politics forecast, a 3-day average of polls was taken and combined with the contextual model to produce the first increase in the predicted Conservative majority (compared with the last forecast) since early May. 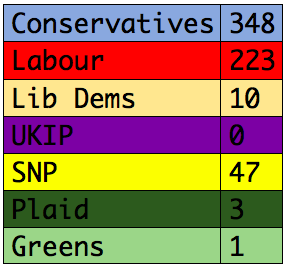 The Uniform Swing (UNS) model calculated the following distribution of seats: Conservative (332), Labour (237), Lib Dems (5), UKIP (0), SNP (54), Plaid (3) and Greens (1). 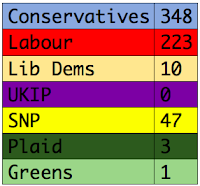 Again, this would constitute a more-than-modest increase of the 2015 Conservative majority of just 2 seats. The implied swing from the last three days of polling has both Labour and the Conservatives up by around 6.5 points (from 2015). In practice, this would be a swing of around about 3% towards Labour. This moves the Conservatives up by 3 seats from yesterday's forecast, reflecting a slight increase in their polling average, and more favourable Scottish swings (namely the SNP moving down a touch). In fact, the SNP's current projected decline is now steep enough to suggest that Labour will take back Renfrewshire East from the nationalist party, according to the 'polls plus' model. 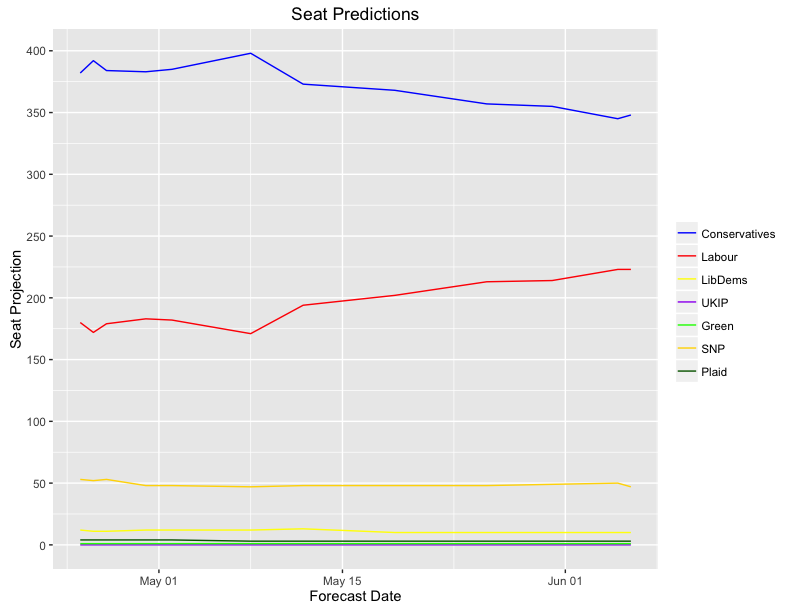 The first expansion of the Tory lead in just under a month can be seen on the prediction tracking graph below. 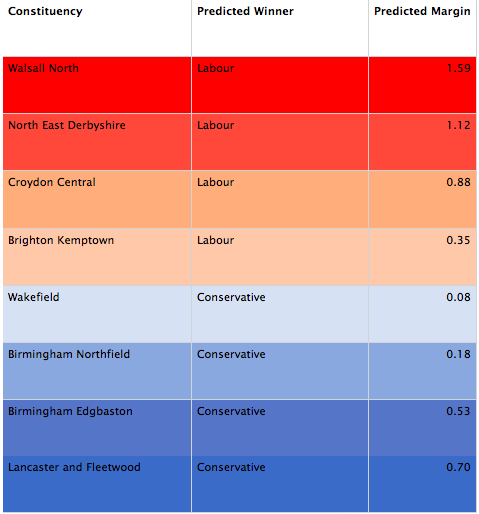 The 'polls plus' model moves the projected marginals up one seat into the Labour defense list, with the Conservatives just predicted to take Wakefield by a threat, based on the current polling and contextual factors applied in the model. Once again though - health warning - this function of the forecast is very much exploratory, and indicates the kind of seats that we might expect to currently be the battlegrounds, rather than constituting a firm prediction of the outcomes there.